Let’s cut to the chase on this one, if you own a 360 this is a game you must have in your collection. For about 1200 ms pts you get hours of some of the most innovative platforming I’ve seen in years. It’s 2d, yet 3d – 3d, yet 2d all at the same time. I love it! Unless you’ve been under a rock for the past few weeks, I could only be speaking about Epic Games’ Shadow Complex. For an XBL game, Shadow’s highly polished and worth every point spent in my opinion. From the soundtrack down to the backing scenery which is gorgeous (ok, maybe not Meghan Fox gorgeous but…). Let’s move on to the plot, Jason the main character here is doing some backpacking with his female companion friend when she falls into some ditch. The ditch is no ordinary ditch though its a massive underground of well..that would be spoiler info hehe. You go in to find her after a few cattle calls return no response..and thus it begins. You’re journey into some secret organization’s innerts. Now why oh why would such an establishment not catch they left an entry point wide open for civilians to find – who knows, but let’s overlook that class and move on. Best platformer on next gen hardware(? ), pretty close I’d say. It’s a shooter in essence where targeting can be challenging at times but not enough to hate it. Health and ammo are plentiful here and there. It’s not TOO easy like some recent ‘Prince of..’ games where you could never really die. You most certainly can die here. When you do though, you’re left wanting to jump right back in. It’s that good! Some of the good parts here include the secret corridors, the ability to always backtrack, and the deception that you can interact with almost every part of the scenery beside you, but alas you really can’t. Yup, it’s that visually outstanding and mind you the entire time it’s entirely still a 2d game. Love it. Please let there be a sequel that stays true to it’s predecessor. That’s all we ask Epic Game Gods..that’s all-we-ask. – Worth the 1200 pts. – Not boggled down by too much plot/dialogue. Pick up play, save & go! – Targeting was challenging, but maybe that was on purpose for the retro gaming experience. 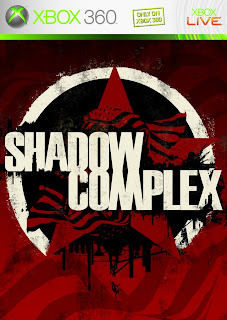 Feed Your Console give Shadow Complex a score of 9 out of 10.